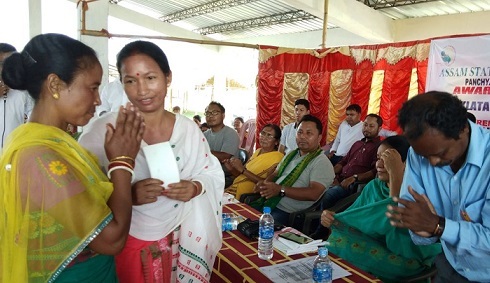 An awareness meet on the Kanaklata Mahila Sabalikaran Achoni (KMSA) was held by the Panchayat and Rural Development (P&RD) Department for ceremonial distribution of funds among the Self Help Groups (SHGs) at the Bhergaon weekly market complex in Bhergaon SDO (Civil) office in Udalguri district on Thursday. Lwmshrao Daimary, deputy speaker of BTC, Nerson Boro and SDO(Civil), Bhergaon, Dithakananda Hazarika where women of SHGs from different villages under Bhergaon Development Block were apprised of the scheme. She further stated that SHGs have always helped women to gain financial independence and open up window of self-employment opportunities. Basumatary also stated that the BTC administration has always rendered its support to the SHGs by launching a number of welfare schemes. In an interactive session, the representatives of different SHGs explained their sources of income, productions, and also about their necessary requirements. Most of them informed that cultivation of turmeric, rice, potatoes besides weaving are the sources of their income. MTC EM Lwmshrao Daimary said that the BTC administration has accorded top priority to women empowerment and is elated to witness village women engaging themselves in different productive business thereby gaining financial independence. BTC deputy speaker Nerson Boro said that there are different schemes to help the Self Help Groups and that BTC administration is ready for extending financial grant to SHGs and for all those who want to engage in different productive works be it cultivation or handloom, etc. A cheque distribution programme was also held where cheques amounting to Rs 50,000 were distributed among different SHGs.